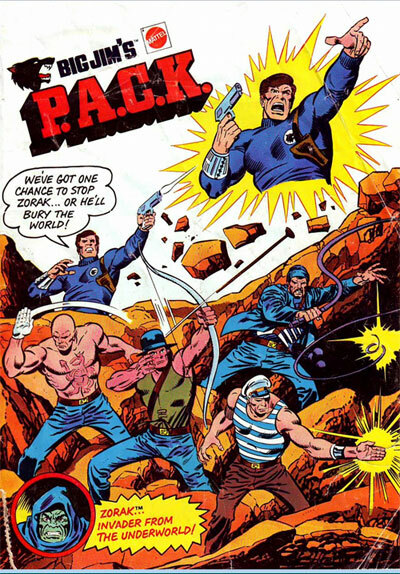 Big Jim's PACK - The Rise of Zorak! 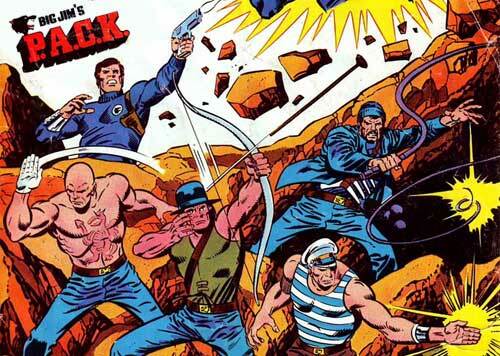 I've often heard comic fans wax nostalgic over the old GI Joe comic book series (probably because it was pretty good and there was a long running cartoon with all the characters) but I've never heard anyone mention the action figure comic that I best remember from my childhood: Big Jim's P.A.C.K! 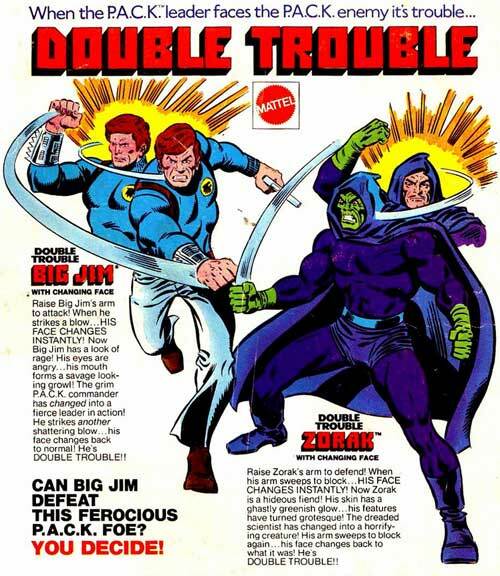 The first line up must've been a bit of a failure (or perhaps the similar sounding names just proved confusing to toy hunting parents) as Mattel quickly produced a revised team featuring much more colorful characters in 1976 with box artwork provided by Jack Kirby. Marvel was also contracted to produce an introductory comic book of all the characters which was superbly drawn by John Buscema. I guess he's a Doctor in Running Around With Your Shirt Offology. 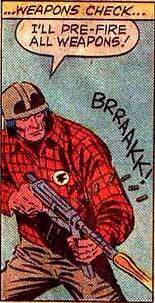 The hunter/tracker of the group is Warpath. 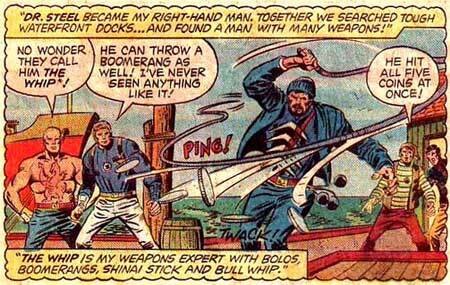 The group is completed with the presence of the bionically armed Torpedo. 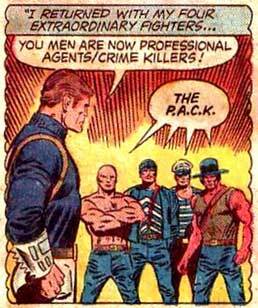 With this rugged team of adventures assembled, Big Jim christens them The PACK which stands for Professional Agents/Crime Killers. I'm not really certain how to parse Crime Killers, but it doesn't sound like this group is going to be reading a lot of Miranda Rights during their exploits. Each member is given a hand tattoo and stamped shoes for easy tracking. That probably makes working in the shadowy world of international espionage a bit challenging, but HR believes it encourages team building, so what are you going to do? Once assembled, the government contacts the PACK to bring down a dangerous adversary: Zorak. 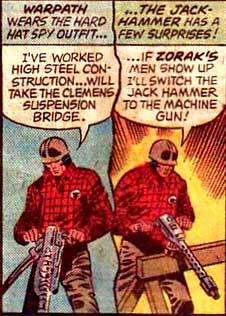 No relation to GI Joe's Zartan, though the names do seem similar. 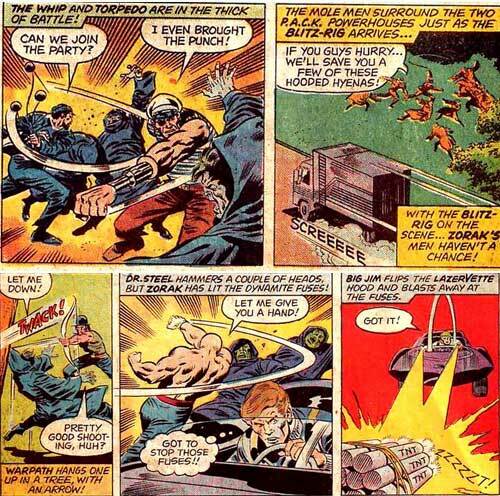 (Fun fact: Zartan was an anagram of Tarzan created by comics writer Larry Hama.) 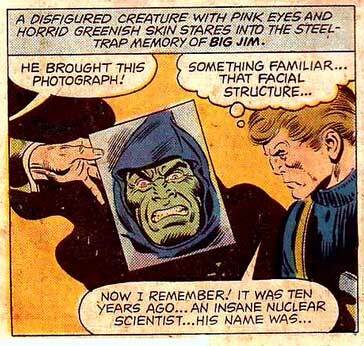 Nor is he any relation to the same named character from Space Ghost, though they are both green. To handle this assignment, the PACK are all given cool weapons and outfits from the government; like Big Jim who gets a awesome car. 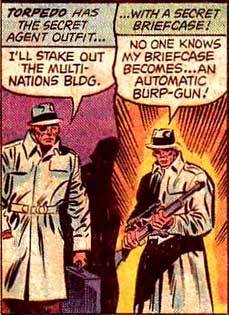 Or The Torpedo gets Secret Agent gear. 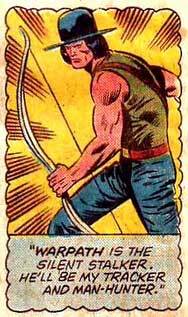 So I bet you are expecting Warpath will get some sort of cool exploding arrows or zip line and cross bow set up, right? Think again. I appreciate that they tried to give Warpath a bit of backstory by saying he's worked construction before, but they probably could've taken another run at this idea before stamping it Ready To Go. Anyway, as the mission continues, each member of the PACK gets a chance to demonstrate that they are as smart as they are bold. So everyone is geared up and proceeds with the mission. The first to encounter the forces of Zorak is Big Jim. Now, maybe this is just me, but if your Team Leader is limited to two expressions: Grim and Angry, then you sort of have to question his planning ability, don't you? Shouldn't Happy, Satisfied or at least Surprisingly Relieved be options? I mean how would you feel if at the end of a successful mission the best face your boss rewarded you with was Grim? You'd sort of wonder what the heck he wasn't telling you. 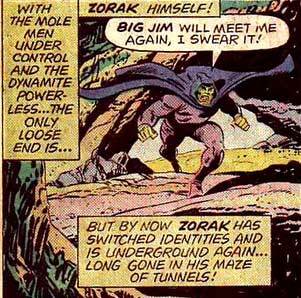 After some covert reconaissance by each team member, Zorak's master plan is revealed and the team springs into action and takes his operatives down in true Big Jim fashion. 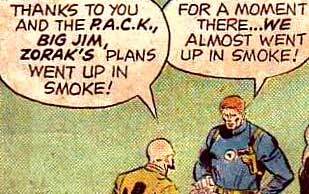 Thus giving Big Jim a good opportunity to use one of the only two expressions he can muster at the end of a mission. One of the other PACK members might want to privately speake to Big Jim about how you sell success. Telling mission command you almost lost the whole team isn't the sort of thing that looks good on your year end performance review. I see another grim faced mission conclusion on the horizon. Hope they rest of you have a week that's Big! What mainstream _superhero_ comic in the last 25 years was really meaningful to you? We're talking stuff published AFTER 1988. Why? 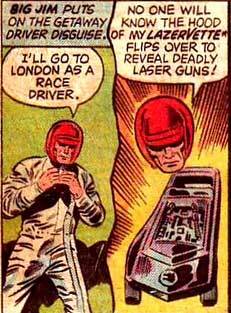 Robinson found a way to really give Jack Knight's character a unique voice in what was becoming a very generic superhero universe. Jack's dilimenas were less about how would he defeat the villain of the day, but rather how would he resolve long standing family issues. If that sounds boring, it's because that is only a small facet of the incredible story that Robinson wove in Starman. 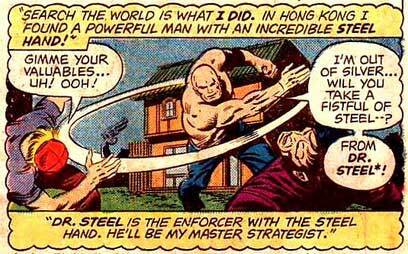 Other elements were great homages to Golden Age heroes, dramatic action with reinvented villains and somber interludes with Jack's dead brother. This is one of those titles that deserves the praise people have been piling on it over the decades. I'm certain that many readers will look askance at such at choice as this book probably is most widely known for its grand guignol style and farcical portrayal of the rest of the DC universe, but you read the series, Ennis takes his time in revealing the rather poignant story of Hitman Tommy Monaghan. In some ways, it feels like the grim old Irish Ballads that are sung in the bar Tommy calls home. I asked another longtime comics fan this question and he came up with two entirely different answers. His first choice was Grant Morrison and Frank Quitely's All-Star Superman. The second choice picked was another that I left after a few issues. Alan Moore's and Chris Spouse's Tom Strong. 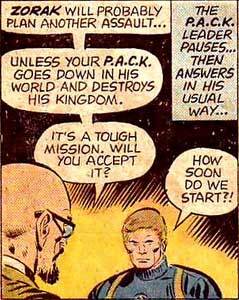 As I was thinking of my answers for Gallaher's question, I found myself remembering the FIRST superhero comic I found meaningful. Jim Starlin's Warlock. Starlin's run on Warlock opened my eyes to what was possible in superhero comic stories. Pathos, satire and allegory - all in one exquisitely drawn space opera. Because of the level of storytelling going on here, this is one of those few Bronze Age classics that holds up well even in this day and age. What Superhero comics have you found meaningful? Can Superman Save the Justice League Movie? Now it appears the first script has been tossed which will definitely delay the movie even if WB decides to go with it. At this point, the Man Of Steel is going to have to hit pretty big to keep the project going. Which got me thinking: Exactly what is the dollar target MoS needs to hit to be successful? Doing a bit of research, I found out some interesting things (to me) about how movie companies and movie theaters split their revenue. I had always heard it was based on a sort of sliding scale with the companies getting the lions share the first week and then getting less as each week progressed. Apparently, that has changed some - now movie companies negotiate a standard cut with the theater regardless of which week it is. Now theaters can get between 45% to 60% of the box office every week. You can actually look at the securities filings for the big theater chains, to look at how much of their ticket revenues go back to the studios, points out Stone. So for example, the latest quarterly filing by Cinemark Holdings, shows that 54.5 percent of its ticket revenues went to the distributors. So as a ballpark figure, studios generally take in around 50-55 percent of U.S. box office money. Also, apparently foreign box office is NOT very lucrative because the splits there are even worse. According to the book The Hollywood Economist by Edward Jay Epstein, studios take in about 40 percent of the revenue from overseas release — and after expenses, they're lucky if they take in 15 percent of that number. The article also says that while DVD sales used to be something studios could count on to help a movie break even, that has become less true starting in 2009 as DVD revenue has gotten weaker. The article suggests Netflix might be the reason for this - which would explain why Time Warner hates Netflix so much. Taking all that in consideration, with a production budget of 225 million, lets say (using worse case percentages from above) Man of Steel will need $250 million domestic and $250 million global to be counted as a money maker. Man of Steel has a budget of $200 million, so I would suspect anything less than $80 million would be seen as a opening weekend failure. With all that said, I think that the movie can make its money back overtime, but will be a opening weekend failure. I predict $75 million for the first weekend. With all that said, I wouldn't hold my breath for the Justice League movie. Not sure if you guys are really digging these Lost 100 Pagers or not (they don't seem to elicit many comments) but I'm digging creating them. With this one, I took the liberty to mock up the Jimmy Olsen image to create neat little Green Lantern themed Olsen story. 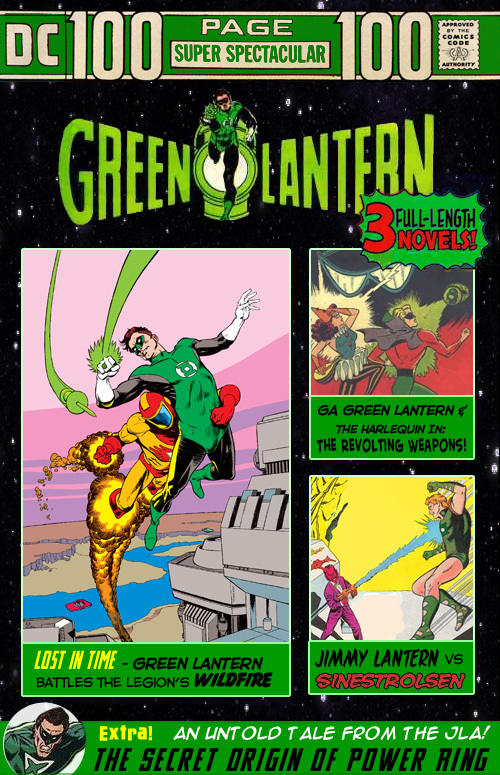 In looking up covers to use for this 100 Pager, I was struck by the fact that Green Lantern never got his own 100 Page Super Spectacular. About as close as he got was the 52 pager. below. 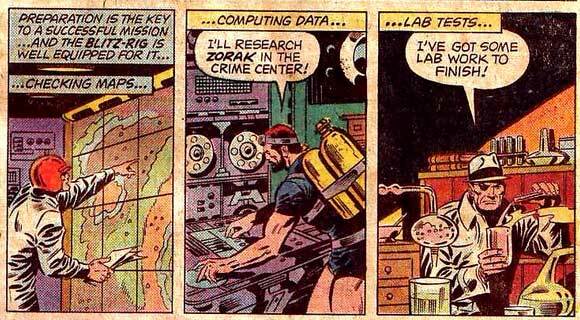 As far as I can tell, Green Lantern seems to have been in a bit on the backburner during this time period. 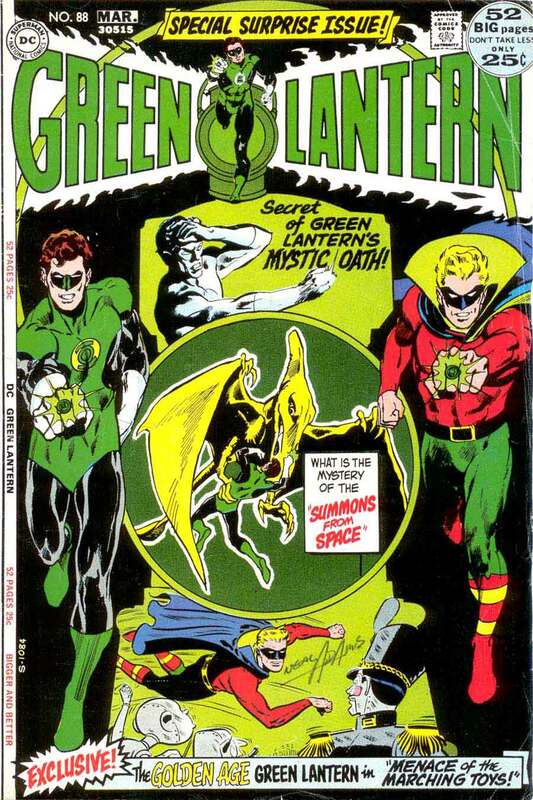 It was before Mike Grell started his Green Lantern/Green Arrow series and some time after Jordan's Silver Age heyday. 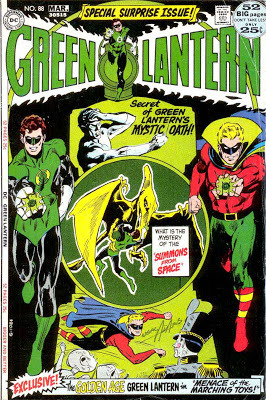 Outside of the recent Geoff John's era of Green Lantern, he's never been a huge pull on a title. 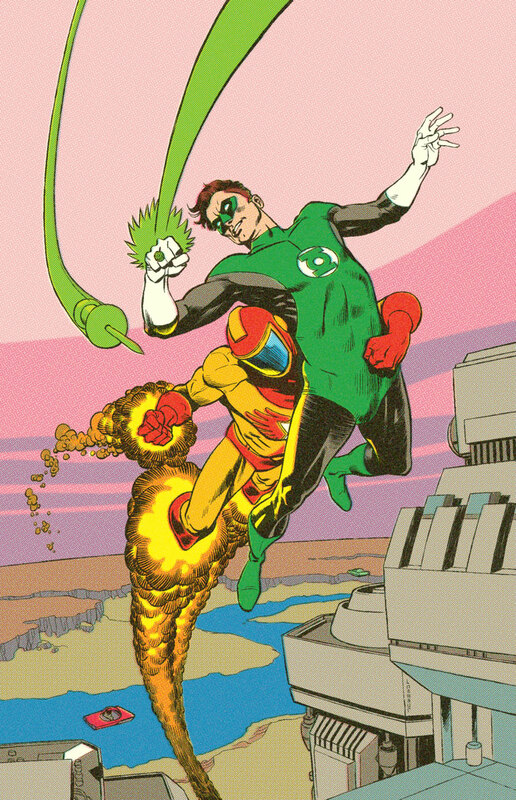 Wonder Woman and The Flash actually have a longer unbroken run than GL. (And I would suspect more name recognition among the general populace due to television shows based off the characters.) This raises the question: Why did Warner Bros decide to spend 200 million dollars making a Green Lantern movie? Why GL and not Wonder Woman or The Flash? The lack of wider name brand recognition might have been a huge factor in the dismal Green Lantern movie opening weekend.